Leo's Passagen: Can Sana’a Survive The Arab Spring? In 1971 during a brief stay in Yemen to film scenes from his already classic “Arabian Nights”, Pier Paolo Pasolini filmed a short and little known documentary about the beauty of Sana’a, the capital of Yemen, under the title of “The Walls of Sana’a”. Rarely screened, this documentary was Pasolini’s appeal to the UNESCO to help save the incredible architecture of the almost 3,000-year-old city. “For Italy, it is all over. But Yemen can still be saved entirely. “We appeal to UNESCO – Help Yemen save itself from destruction, begun with the destruction of the Walls of Sana’a. “We appeal to UNESCO – Help Yemen to become aware of its identity and of what a precious country it is. “We appeal to UNESCO – Help stop this pitiful destruction of national patrimony in a country where no one denounces it. “We appeal to UNESCO – Find the possibility of giving this nation the awareness of being a common good for mankind, one which must protect itself to remain so. “We appeal to UNESCO – Intervene, while there is time, to convince an ingenuous ruling class that Yemen’s only wealth is its beauty, and that preserving that beauty means possessing an economic resource that costs nothing. Yemen is still in time to avoid the errors of other countries. 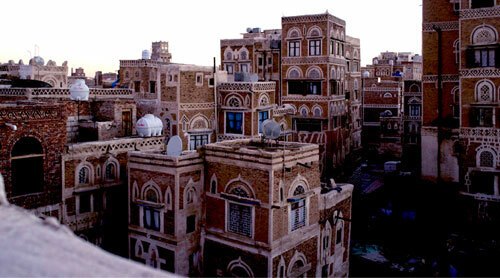 Pasolini’s appeal resonated in Europe and in 1986 the city of Sana’a was declared by UNESCO a world heritage site. His appeal however, followed by the decision of the international body, did little to rescue the ancient buildings from their disastrous condition. In 2006 photojournalist Eric Hansen published in Saudi Aramco World an impressive travel photo-log of his journeys to Sana’a between 1978 and 2006, concluding that even though many significant changes had been made, roughly 40 percent of the ancient city was gone or in a very bad state. In his reportage, Hansen further added that Sana’a “has survived flash floods, earthquakes, massacres, repeated looting by tribesmen, civil wars and even, in 1991, Scud missile attacks. The city’s architecture has been demolished, damaged and rebuilt innumerable times, but in every instance, Sana’a has risen from the debris and survived”. It is however unclear whether Sana’a this time will be able to survive the Arab Spring. Cultural destruction is already the norm rather than the exception in the Middle East and can be seen everywhere from Morocco to Bahrain. Many examples come to mind: The area surrounding the old city of Jerusalem known as Mamilla, the legendary neighborhood Wadi Abu Jameel – the old Jewish quarters – in Beirut and most prominent, the holy city of Mecca in Saudi Arabia now famous not only for the annual hajj pilgrimages but also for having destroyed nearly everything Islamic and otherwise to make space for comfortable hotels and other luxury residences. The destruction of Sana’a however has been seldom reported anywhere. According to eye-witnesses writing for an American newspaper in November, nowadays the tanks, mortar and firefights rumbling and cracking through the ancient city of Sana’a are endangering not only the future of the country but also its magnificent architecture. Despite the urban sprawl, the city has managed to remain more or less intact and the architectural style that Ibn Rustah described has been preserved well into the 21st century. After the end of the civil war in 1969, traditional life in Yemen began to change radically as many expatriate workers returned and began to fuel an uncontrolled modernization of the city. Since Sana’a was declared a world heritage site, many conservation plans were put in action in a combination of public and private initiatives, international organizations and foreign investors – all of which has been put to a halt since around 2007. Even though efforts were underway to preserve the old city itself, right outside, both Bir Al-Azab – the historic Turkish residential and garden quarter – and Al-Qaa’ – the Jewish, Christian and Persian neighborhood – lie neglected because in the words of a government official “there is no money to preserve them – and little interest”. UNESCO has urged the government of Saleh to protect the architectural character of the old city, and they have expressed their “deep concern” about the state of preservation while the residents and shopkeepers in the old city are increasingly anxious about the unrest since the inflation and sense of insecurity have driven out all tourism and radically ruined the local economy. The vision of Pasolini might seem to us today a little charged with Romanticism; however the appeals that he made to the UNESCO remain today as valid as they were in 1971 and should include not only Sana’a but so many other secrets of “Arabia Felix”: Marib, Serwah, Quernow, Barakish, Djiblah and Shabwa, to mention only a few and whose history dates back as far as 11th century BC. To save buildings alone however, without the diversity of cultures and peoples that live in them, is nothing but a futile and merely aesthetic enterprise. Many cities in the world have “preserved” their historical heritage by driving away their own working-class population from historical centers and then turning them into lavish palaces for the wealthy, depriving these centers from all the sounds and smells of traditional cultures, turning them into museums that are only open for distant observation. Yemeni cities and antiquities – abundant as they are, have been threatened and despoiled for centuries, ruined, demolished, burnt. In the same way that Pasolini appealed to the UNESCO, I would like to appeal not to international bodies but to the people of Yemen and to recent Nobel laureate Tawakul Karman to not let their country be ransacked and destroyed by the imperatives of the present, to use their recently gained influence on the international stage to save the old city of Sana’a and other places in Yemen from ultimate destruction. In 1974 after Pasolini had been in Yemen, he reflected about the direction the modern world had taken: “To reach the standards of living of the West, the peoples of the Middle East will abdicate their ancient tolerance and will become horribly intolerant”. His words, poetic as they are, wouldn’t resound so strong today if they hadn’t become the living reality of the Middle East for decades now. The preservation of Yemen’s antiquity is not only a matter of aesthetic comfort but rather represents an ideal of political life – cultural heritage is one of the most elementary forms of nation-building. The ancient tolerance to which Pasolini appealed, struck by the beauty of Sana’a, was not the contemporary idea of barely tolerated peoples and ideas, but rather, a deep appreciation of the cultural diversity so deeply entrenched in the history of the region.